This project functions as a ceiling light fixture. The pattern was created in a Python DXF generation tool I wrote that uses recursive branching algorithms to create shapes. There are endless nature-like possibilities in the shapes that can be made this way, and I plan to create many more varieties of these. Celestial Mechanica is a 16-ft tall kinetic steel sculpture of our solar system representing the majestic dance of the heavenly bodies. It was created by a team led by Jessika Welz for Burning Man 2014. I designed the main drive system for the orbits of the planets as well as doing a large portion of the structural engineering on the piece to ensure it will withstand 90 MPH winds. Squared by Charles Gadeken is a 50’ tall obelisks made out of square steel tubing and 800 cast polyurethane cubes with inset full-color LEDs. Each cube is geometrically arranged in a fractal orientation, creating a 30’ canopy that provides shade by day and light by night beneath each obelisk. My involvement with the project was in programming patterns, devising fabrication techniques, CNC work, and onsite construction. Tympani Lambada by the Flaming Lotus Girls is a sculptural embodiment of the structures by which we hear and balance, combining fire, vibration and sound to create an experience rich with visceral sensuality. The bone and membrane of the inner ear’s vestibular system is transformed into steel and fire. Tympani’s steel arches are transformed into the appearance of bone by a custom paint finish, giving the surface a unique tactile experience. This sculpture takes the seldom seen structures we depend on every day and shows them off at a stunning scale. My roles in the project were designing and managing the building of the electronic fire control systems and mechanical sound effect system; designing the fire effect for the main arches which utilizes a unique venturi and baffle system to create a single blade of flame along the arches; and (for a 2014 reshowing) writing a new Python program to run the fire effects on this and other Flaming Lotus Girl Sculptures. This is a group of very unique smaller sculptures by Charles Gadeken, where he did the conceptualization and lead fabrication and I did the design and building of all of mechanical and electronic systems involved. Aperion is a 12 foot tall plant with three tesla coils coming out of flowers at the top. The tesla coils are solid state and each one is capable of reproducing any audio input by modulating the arc. 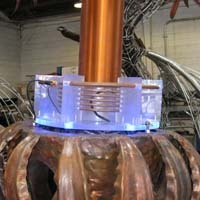 We can connect microphones, theremins, keyboards, or even smartphones to the tesla coils, giving participants at festivals a variety of ways of interacting with the sculpture. Spike has two counter rotating spinning shapes on fire inside of it to create a very dynamic look as the fire dances inside, filling the volume of the sculpture. 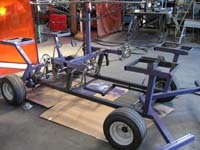 The mechanical design was challenging due to having fairly limited space for the linkage, motor, rotary fuel unions, and bearings, but a unique and reliable solution was created using CNC cut plates and a flexible chain linkage moving over a curved guide. Nous is a 9' tall graceful plant with 9 fire-shooting flowers. The flames can either be controlled by audience members or by a computerized controller. The controller allows an on-the-fly programming of rythyms, with a wide variety of variables to play around and create different patterns with. There is also a random mode, and there will soon be a MIDI interface to tie this and other sculptures in with performances. Pneuma has a spinning cone of fire as well as a fire vortex element coming from the center. The fuel flow rates and motor speed can be controlled independently, creating a great variety of dynamic effects. There is also fire in the lower leaves. Although it was the first of Charles’ pieces that I worked on, it was the most challenging of all from a design standpoint. The rotating cone has fuel lines going to both the inside and outside of it, and the tight diameter of the stem made it impossible to fit the motor, drive chains, and a standard rotary union together. After a good deal of thought and CAD modeling, I arrived at a the solution involving a custom made rotary union integrated with the support shaft. 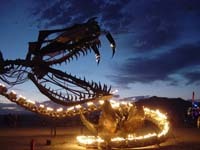 This is a sculpture by the Flaming Lotus Girls, and is currently set up for a 1 public year install in San Francisco. 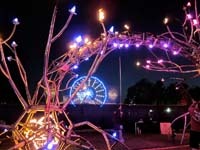 It is a large metal representation of a pair of neurons, with color changing LEDs on the tips and fire running down the axon that arches between the cells. All of the LEDs, fire effects, and motors are computer controllable over a main serial interface. I assisted in a variety of aspects, including onsite setup, soldering the custom SMD pc boards, building the plumbing for the fire effects, and designing some CNC cut parts. 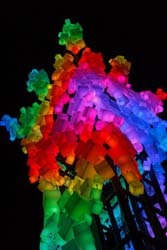 This is a sculpture by the Flaming Lotus Girls, a large collaborative female-driven group. It is a giant serpent coiled around her hatching egg. She has fire running down her spine, multicolor LEDs, and a large hydraulically moveable head. I have been involved in a variety of ways including assisting with fabrication in 2006, setting up and running the hydraulic system at a number of events since, and various electronics upgrades and repairs.